New, monster size, extra long 18' KaBoats are now available and were custom produced for outfitting in our hunter green 1100 DTEX PVC. The SK548XL KaBoats are designed to for maximum gear and passenger space. Our huge, 16" diameter tubes and an extra spacious interior make the SK548XL KaBoat perfect for fishing, hunting, or expedition trips. The SK548XL model has 4 separate air chambers for extra safety. Our extra heavy-duty rub strake protectors are installed along both sides of the tubes for enhanced durability and rigidity and our patented drop-stitch air deck floor is a perfect compliment. 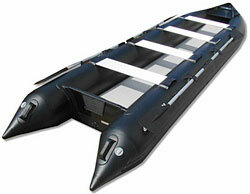 Extra thick, high-pressure 140mm inflatable air deck floor. 4 (four!) separate air chambers for extra safety. 4 lightweight aluminum removable benches.